Material on this blog is copyrighted by M. Kirby Moore. Reproduction without permission is strictly prohibited. Thanks and enjoy the posts. This is a picture of Drupon Thinlay Ningpo Rinpoche. He is the spiritual director for the Drong Ngur Jangchub Ling meditation center near Tampa Florida. Drupon is one of the most patient, wise and lovingly-kind individuals I have ever come across. His heart is vast, gentle and steadfast. Words are not able to penetrate the meaning of what he embodies. And for an endearing quality, which I believe validates his spiritual accomplishments, he neither needs nor pursues fame. I am just beginning to understand, that it is not how long one has practiced Buddhism that matters. What matters, according to my poor understanding, is that we renounce samsara (the potentially endless cycle of grasping and hatred: suffering and dissatisfaction), stop harming ourselves and others and maintain our vow to benefit all sentient beings until they attain enlightenment, that we maintain our practice of Bodhicitta. This is known as the Mahayana motivation, which, when embraced in our daily activities, brings about great results. 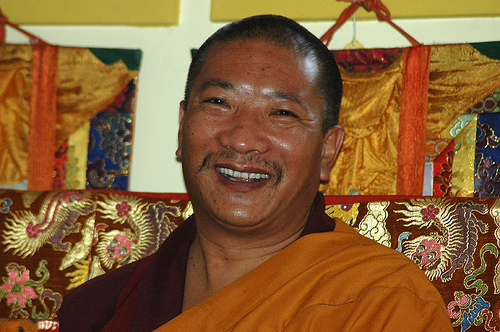 I had the great fortune to study under Geshe Jampel Thardo, a secret tantric master, and when I asked him if he practiced tantra or advanced deity practices, all he would ever tell me was, “My practice is Bodhicitta.” He was being skillful in “lying” to me, or, in a sense, because Bodhicitta penetrates and permeates every Buddhist practice we do, he was also telling the truth. I had the blessing of being present when Geshe-la dissolved into the mandala (passed away). He informed his students when he would die, then he told them not to move his body for three days, that he would be deep in meditation, and sure enough, he lay down for the last time and his heart stopped beating. For three days, he maintained a relative straight lying position, and on the third day, he manifested signs of realization – a red drop came out of his left nostril and a clear (white) drop came out of his right nostril and he slumped over. At that point, his subtle consciousness had departed his body. Along with many of his close students and members of the Tibetan community, I was very blessed to have empirical, visual evidence of the results that are possible with diligent, daily practice. May all sentient beings meet and study with such a qualified spiritual teacher, a secret, humble yogi. The word “Dharma” might be a bit confusing. In Sanskrit, according to my extremely limited knowledge, the word Dharma has at least 20 meanings. The word Dharma can be a verb, an adjective, a noun, an essence, a conception and more. It can be the Buddha’s words (capital “D”), the teachings that have been passed down from the Buddha, it can be Buddhism as a whole (Buddha-dharma), it can be practiced, it is also one’s primary motivation for living life, it can be someone’s job (in a sense). There are other meanings that I am not remembering, but in general, when I use the word “Dharma,” it primarily has to do with Buddhism and / or the Buddha’s teachings – the texts that remain from this lineage of healing wisdom. they might be). It might very well be a desire for fame and recognition, which would not be a good reason to be doing so. However, I must admit that I am surrounded by incredible practitioners whose renunciation, humility, vast knowledge and immensely kind hearts are inconceivable, and often times on a daily basis I am floored with grateful humility. Compared to a good number of my friends and teachers, I am a mediocre practitioner, a scatter-brained reporter of their great virtuous traits and actions. Just know that there are thousands of beings on the planet, known as Bodhisattvas, who are practicing loving-kindness and compassion toward all sentient beings, in secret – they hold the light and the balance for these dark times. One day soon, may I and all beings join their ranks. Edited Nov 2017: I do believe that the words I wrote above, seven to ten years ago, are some of the most profound I have put together. I’m not trying to top them here. With that said however, I am very interested in how our personal spiritual practice evolves over time. Sometimes the gross levels need to be worked through in an arduous manner – for instance, by doing more than a hundred thousand prostrations (refuge practice). But then what? Things become more and more subtle. The benchmark of how much self-care and kindness to self can I maintain on a daily basis needs to be seen, and then we can compare our progress from year to year. I firmly believe that it is not about how hard or how much we practice, but how much renunciation (on a daily basis) do we maintain. How aware are we of our vices and virtues? And what are we doing to shift that balance toward the virtue side? With that said, I also believe that sometimes an adjunct therapy can be very beneficial in addition to maintaining a tried-and-true religious / spiritual path. For me, this is somatic awareness through bodywork and other somatic therapies. A wonderful commentary on your teachers. You are so fortunate! You are also very fortunate and I wish you extraordinary amounts of joy and happiness! May our teachers and their Dharma activities live a long time and spread far and wide. I was in Laddak, visited Lama Yuru, Alchi and all….Missed His Holiness…he left hours before we arrived…. I received the Powa from HH many years ago. Please, give Him my Respect and Love. It sounds like you received some great blessings. Thanks for reading and if I ever have the chance, I will pass along your good tidings.